International climate science shows that warming of the climate system of our Earth is unequivocal, and that impacts such as sea level rise are already measurable. The City of Cape Town is committed to tackling climate change challenges. Read more below. International climate science shows that warming of the climate system of our Earth is unequivocal, and that impacts such as sea level rise are already measurable. The City of Cape Town is committed to tackling climate change challenges. Read more below. Globally climate change causes drought, floods, storms and sea surges and heat waves. These have a destructive impact on people’s health, homes, food security, natural assets and livelihood support networks. This results in social dislocation and large-scale financial loss. The first people to usually suffer these consequences are the poor, who are most likely to live in areas at risk. An increase in both the intensity and frequency of storms: short, high intensity rainfall events and increased size and duration of coastal storms. As a city with one of the longest coast lines, we also face extreme vulnerability to rising sea levels and the associated impact on low-lying urban and coastal environments. 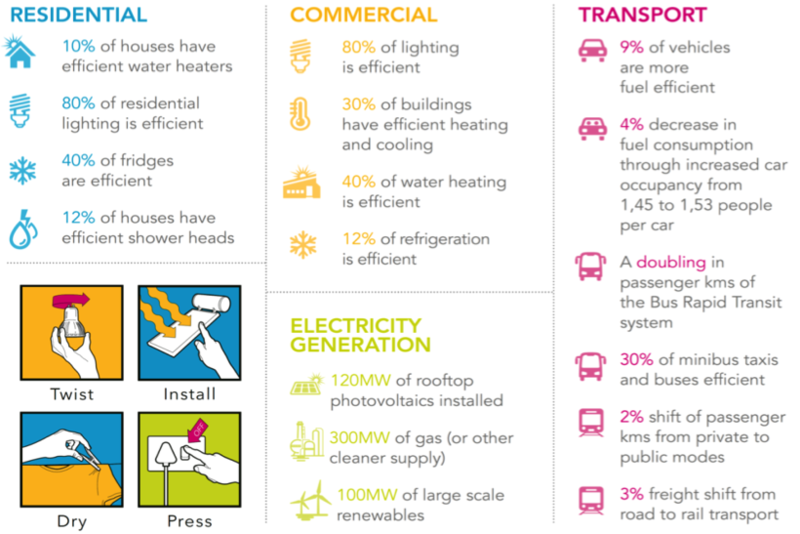 What the City of Cape Town is doing to address climate change? The City of Cape Town is committed to tackling climate change challenges, contributing to global efforts to reduce GHG emissions and building a more resource-efficient and resilient future for our city. The City has a long and well recognised past as a leading city in South Africa in local energy and climate planning and action, being the first African city to complete a State of Energy Report in 2001 (updated in 2007, 2011, 2015) and adopt an Energy and Climate Change Strategy (2006). The City has also adopted the Energy and Climate Action Plan (2010), the Climate Change Policy (2017) and made associated institutional changes. The City actively engages in international climate networks and reporting platforms. 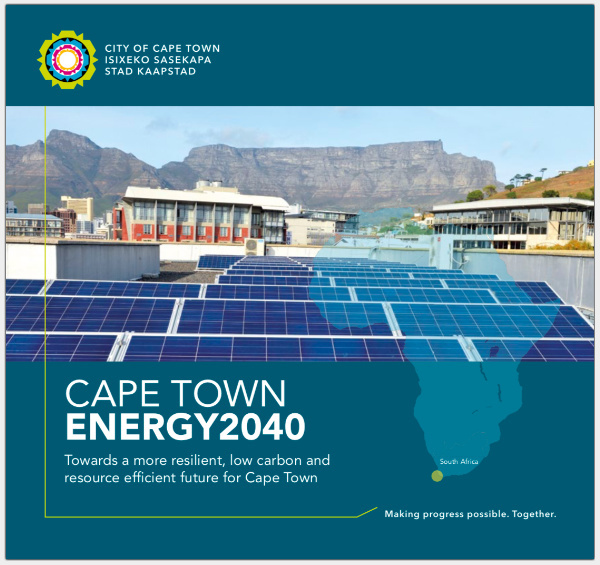 In 2015 the City of Cape Town adopted the Cape Town Energy2040 Goal, with its associated energy and carbon reduction targets. 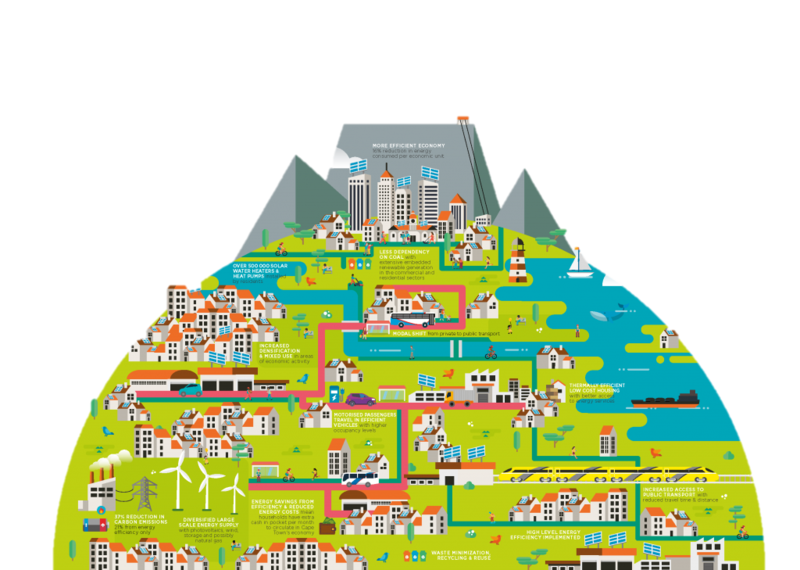 The Energy2040 Goal, which models a more resilient, resource efficient and equitable future for Cape Town, commits the City to diversifying Cape Town’s energy supply, becoming significantly more energy efficient and reducing carbon emissions. More recently (November 2017), under the C40 Deadline 2020 programme, the City committed to developing a pathway to carbon neutrality by 2050. The Sustainable Energy and Climate Action Plan (SECAP), provides the five-year implementation plan for Energy2040. Projects included in the SECAP span transport, spatial planning, waste management, energy efficiency, clean generation and low income energy services. The Energy and Climate Change work runs transversally across all City departments and is coordinated by the Energy Directorate. The road to sustainability is a shared responsibility and requires long-term dedication. In committed partnerships with our residents, the business community and civic organisations, we can make our city a more sustainable and more habitable place.